Watercolor Works: Beginner's Watercolor DVD Now Available! 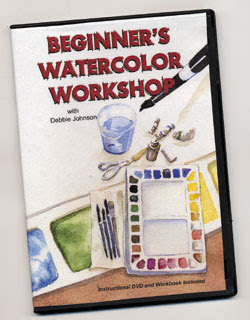 I wanted to let you know that my new DVD, “Beginner’s Watercolor Workshop” will be available as of Friday, May 8, 2009. This project has been in the works for the past two years and has finally come to reality. The DVD contains over an hour of instruction, plus a printable, 20-page workbook on the disk. The workshop walks you through the basics of watercolor in an easy to follow format. It would make a great gift for anyone who has the desire to learn watercolor painting. For those of you who have taken my class, it is a great review, plus it includes some of my latest and greatest tips on washes and brushwork. It is a wonderful introduction to the fun and challenging medium of watercolor for beginners and those who have been painting for awhile. A YouTube preview should be out by early next week!